This castle is a short distance from Agen and is therefore a perfect base for several activities, both cultural, gastronimisch and sporting area. But if you want a holiday with peace, charm and a certain class, then you are certainly in place here .The whole consists of three parts that can be placed separately, but also in 1 rental. The main building is the Chateau which has been restored in authentic style. In addition, modern comfort has been added so that you will lack nothing. There is a sleeping place for 15 people. The Bergerie is next to it and the same style is also used here. Here is a place for 9/10 people. The Four a Pain is small but cozy and is located on the other side of the cour seating for 4 people.There is a large swimming pool with sun loungers and parasols, which is available for the entire complex. 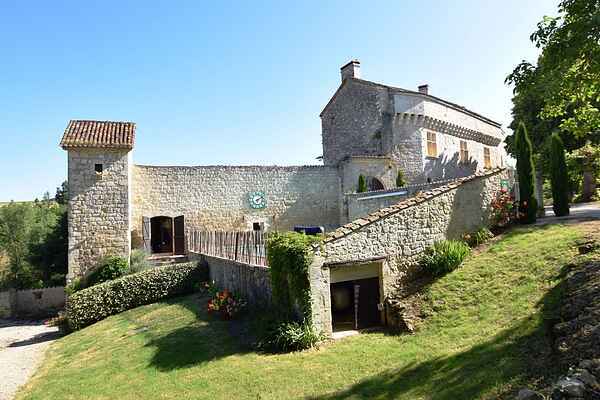 Nearby are the famous Bastides Monpazier and Monflanquin, and the river Lot is a stone's throw away. Various activities are organized by the owner, and if you think of something yourself, the owner will do his utmost to help you as correctly as possible.